00:00 Louise Mulcahy on concert flute with accompaniment on harp by her sister Michelle plays a selection of reels - “Early Breakfast” and “Jimmy McKiernan’s”. Recorded at a special concert on 17th May 2014 in the Lime Tree Theatre, Limerick to celebrate the launch of the exciting new TradTime (Comhaltas Schools Outreach) Scheme for the teaching of traditional Irish music, song and dance in primary schools around the country. TradTime is presently compiling a panel of potential Tutors for every county over the coming weeks (up to mid-August). Persons who have the necessary skills, expertise, reliability, etc. can get an application form and full details at www.tradtime.ie. 03:47 The Mulcahy family from West Limerick with Michelle on concertina, Louise on flute and their father Mick on accordion, play three reels - “Michael Anderson’s”, “The Drunken Landlady” and “The New Line”. Recorded at a special concert on 17th May 2014 in the Lime Tree Theatre, Limerick to celebrate the launch of the exciting new TradTime (Comhaltas Schools Outreach) Scheme for the teaching of traditional Irish music, song and dance in primary schools around the country. 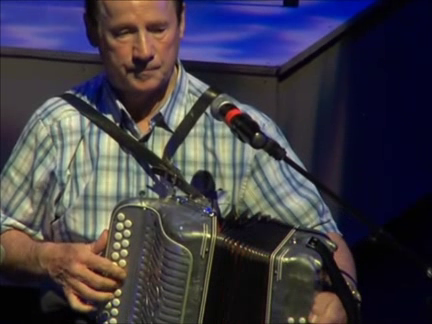 08:06 Recorded at the Comhaltas North American Convention and Regional Fleadh Cheoil held in Parsippany, New Jersey in April 2014, duet winners Benedict Gagliardi on concertina and John Warner on pipes (which he made), both from Connecticut, play a selection of polkas - “Ballyfin” and “Jessica’s”. 10:37 A selection of reels - “Kiss the Maid Behind the Barrel” and “The Swallow’s Tail” - played on tin whistle by Keegan Loesel, Kenneth Square, Philadelphia after he won the Tin Whistle Slow Airs Under-15 Competition at the Comhaltas North American Convention and Regional Fleadh Cheoil held in Parsippany, New Jersey in April 2014. 13:31 Two hop-jigs - “The Promenade” and “The Butterfly” - played by fiddlers Armand Aromin and Jayne Pomplas, New York at an informal session at the North American Comhaltas Convention 2014 in New Jersey. 15:41 One of the Tutors with the TradTime (Comhaltas Schools Outreach) scheme, Enda Seery from Co. Westmeath plays two of his own composition (jigs) - “Santa Cruz” and “Friends from the States”. TradTime is the new scheme for the teaching of traditional Irish music, song and dance in primary schools around the country. 18:29 At the Scoil Éigse Tutors Concert at Fleadh Cheoil na hÉireann 2014 in Derry, Eileen Gannon (harp), Daithí Kearney (banjo) and Dean Warner (piano accordion) play a selection of reels - “Glen of Aherlow” (composed by Seán Ryan) and “Miss Monahan”.